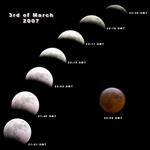 It was the best lunar eclipse in the last decade and certainly the first one that I took the time to observe. Due to light scattered in the Earth's atmosphere, the moon was visible even while totally in the Earth's shadow. Blue light scatters the most in the Earth's atmosphere, making mainly the red light to hit the moon. In ancient times such a moon as this was called "blood moon" and usually associated with catastrophes or big changes to come. I am glad we have moved on from that. This entry was posted at 12:23 PM.